Jody Levett insists things are moving in the right direction at Worthing Raiders. 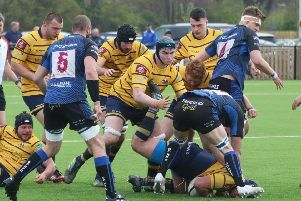 A try double from winger David McIlwaine, along with scores by youth product Harrison Sims and Joe Spurgeon ensured Raiders ended another National 2 South campaign with a 26-19 win at London Irish Wild Geese on Saturday. Victory in their final fixture of the 2017/18 season - couple with other results going for them - meant Raiders ended the campaign in seventh position. That is a marked improvement on head coach Levett’s first season in charge. Raiders only survived relegation on the final day of the previous campaign, with Levett delighted with the improvement being made. Levett is now setting his sights on bettering the achievements of this season next time around, which would mean a top-six finish in 2019. He added: “The aim for next season is to continue to build on the foundations of this one. Over the summer break we will reflect on the things that have gone well and the areas that we need to improve on.